Update 9 AM, February 28: Bethesda has stated that at the time the benchmarks were conducted optimizations specific for the PC platform had not been done. So the test results of the Alpha represent performance in a console-optimized state. Needless to say, this means that performance for both IHVs will significantly increase by retail. 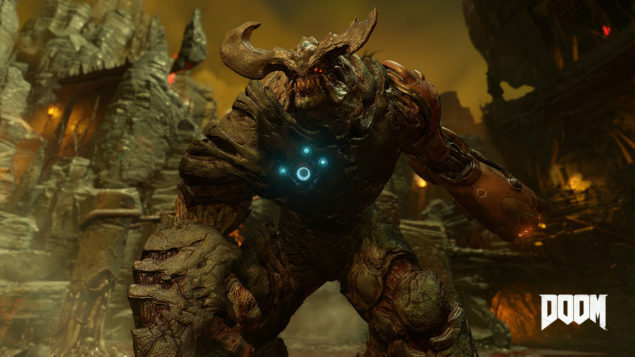 Original: Doom (2016) is an upcoming game that is of significant interest to enthusiasts, one of the reasons being the fact that it is being made in the id Tech 6 game engine. This particular engine is based entirely on the OpenGL API, which means that the usual optimizations of DirectX achieved by both GPU vendors don’t apply. 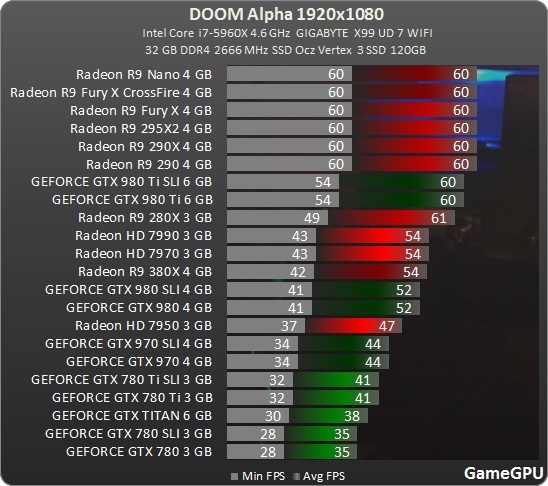 In the preliminary testing done by GameGPU – the benchmarks show Radeons having quite an edge over their green counterparts – something which is probably due to the underlying architectural differences. A screenshot from the Doom Alpha build 2016. To begin with the 1080p benchmarks, all AMD high end offerings perform better than Nvidia counterparts. In fact the R9 290, R9 290X, Fury X and the Nano all perform better than similarly priced Geforce graphics cards. The R9 Fury was not tested, but by all rights it should be just under the Fury X. Everything in the Geforce lineup from the GTX 980 Ti to below come in after the R9 290. Of course in a game such as this, and at the 1080p resolution, all AMD and Nvidia high end cards output a maximum fps of 60 – with the actual difference visible at the minimum fps side. It is a somewhat similar story for the Doom (2106) 4k benchmarks as well, although the average maximum fps is no longer 60. 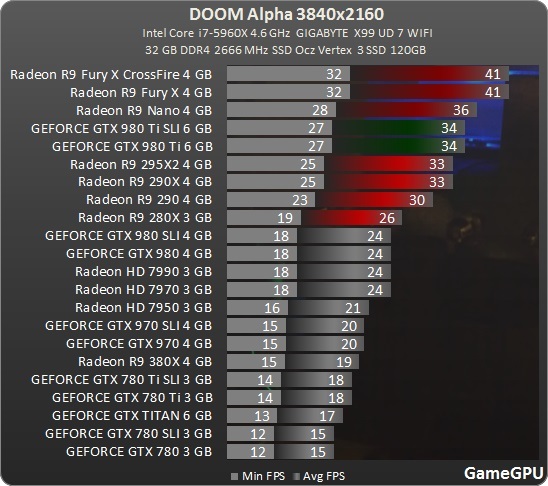 AMD’s Fury X GPU manages to score 41 max fps with the 980 Ti clocking in at around 34 fps. GameGPU also tested SLI and Crossfire configurations as well as the R9 295X2 but keep in mind that multi-GPU is not supported in the current build so they will perform exactly the same as a single GPU configuration. On the 4K side of things, the Geforce GTX 980 Ti performs just above the 290X and just under the R9 Nano. The GTX 980 comes in under the Radeon 280X. Funnily enough, the Radeon R9 380X actually under performs and is lower down the line – probably due to the fact that its bus width is lower than its predecessor. The memory usage stats collected by GameGPU show that Doom 2016 consumes anywhere from 1.8 Gb to 2.7 GB of vRAM so memory is clearly not a bottleneck for high end offerings with 3GB or more vRAM. The showdown, it seems is happening between the raw performance of a card and the optimizations offered by the drivers to run this game. We will probably see game performance increase before the title actually hits the shelves so these numbers are far from set in stone. This title also helps emphasize the need of a low level API, and why low level APIs like DX12 and Vulkan have been a long time coming.